Have you heard of the Perl? It’s a nifty new e-cig that’s barely on the market and is being sold in limited supplies by the manufacturer. The Perl impresses from the moment you see it, with its sweet little design – which the package is designed to mimic (I know, no big deal but a nice little touch), you just want to get this in your hands. And let me tell you, it fits perfect into the hand. It’s a perfect size and barely weighs anything at all, so cupping it in the palm of your hand is a treat. The icing on the perfect little cake? And by smart I mean that there are no buttons, but it has a touch sensor technology to anticipate your needs. Let’s start at the beginning before I get off on an excited tangent. The Perl comes with everything you need to get started, minus the juice. With the starter kit you get the nifty little Perl itself, and two 2 ml “ceramic pods,” 2 mouth pieces, a charging cable and two little dripper funnel things designed to get the juice into the pod. So, when I got this and opened it up – in awe let me tell you, I love sweet new toys – the first thing I did was turn to the included user guide. Mainly, this was a necessity because unlike most vape devices, I did not have a clue where to begin. A higher level of nicotine (12 to 18 mg) is suggested for the Perl, I figure it’s because of how the Perl works. I dug around through my stash and came up with a bottle of 12 milligram nicotine strawberry funnel cake. Let me tell you, I loved this flavor when I tested it, but it’s been sitting in my stash for months and I’ve tried repeatedly but just can’t vape it with my normal toys. So, I figured, what the heck, I’ll give it a shot. The instructions tell you to remove the pod and mouth piece with your fingertips to fill the tiny little 2 ml pod with juice. This was a bit of a pain to get this little sucker out of there but I eventually popped it out. Didn’t take much at all to fill it and get it back in the Perl. Now, I read and read the instructions and I didn’t see anything telling me that the pod needed to prime. I did see how all I needed to do was put it to my mouth and inhale to activate. So, naturally I had to try. Wow. I was instantly impressed. The Perl is completely silent. Honestly I didn’t know I had actually taken a hit until I blew out the vapor. The really, really good tasting vapor. And, for such a little bitty guy, there was a decent sized cloud. Now, the Perl has three settings that can be changed by holding your finger over the sensor. Basically, just watch the little lights as they light up. It’s too easy, basically dummy-proof. I had filled up the pod and was vaping away and let me telling you that I loved the silence. And I wasn’t the only one. I didn’t have the Perl for 30 minutes before my husband said “ohh what’s that, let me see.” Now, he’s not a big vapor. To be honest, he’s still primarily on the stinky sticks, except for a tank of CBD that I keep handy for him. The Perl just mesmerized him. And he loved the silence too. He said it was nice to vape without sounding liking you were starting a jet engine. Yup, he thinks he’s funny. Like any device I review, I basically make it my regular vape for a few days so I can get an idea of battery life, how often I need to fill it and all those nifty things. It took me more than a week to drain the battery on the Perl, which I have to say is impressive. The instructions say that it will flash at you when the battery gets low, but I first noticed a decrease in the intensity of the hit. Then when I went to charge it, it only took about an hour to get it going again. Again, impressive. Now let’s talk about this dinky little 2 ml pod. Only 2 mls? My first thoughts were that I was going to be filling this little sucker all the time. It took about a week and a half of using the Perl before I had to fill it. It’s got a little window to see your juice level –which is very handy – and I kept checking the window but it didn’t seem like the juice level was going down at all, no matter how much I used it. Dang, a 2 ml pod that lasts and lasts. Now, when it came time to fill it again, it was a bit of a pain to get the pod out and back in again. But, it’s the kind of thing that becomes second nature the more you do it. These ceramic pods say that you can refill them up to 15 times, and it comes with two of them. Dang, I’ll probably be in flip flops by the swimming pool before I need to fill it again. Now down to price, the Perl starter kit sells for $59 and it available in black and white. I was sent the white one and my biggest complaint on color is that is gets dirty very quickly, just by regular use. If you have a dirty job, you may one to go for the black. Bottom line, $59 for the Perl is an awesome deal. It’s a great set up and a really awesome device. It was fun for me to play with and I’m definitely impressed but I have to say it’s not for me. I happen to like my jet engine as my husband calls it, with a good strong throat hit. But if you’re someone like my husband who enjoys the quiet, the smooth, gentle hit, go for the Perl. 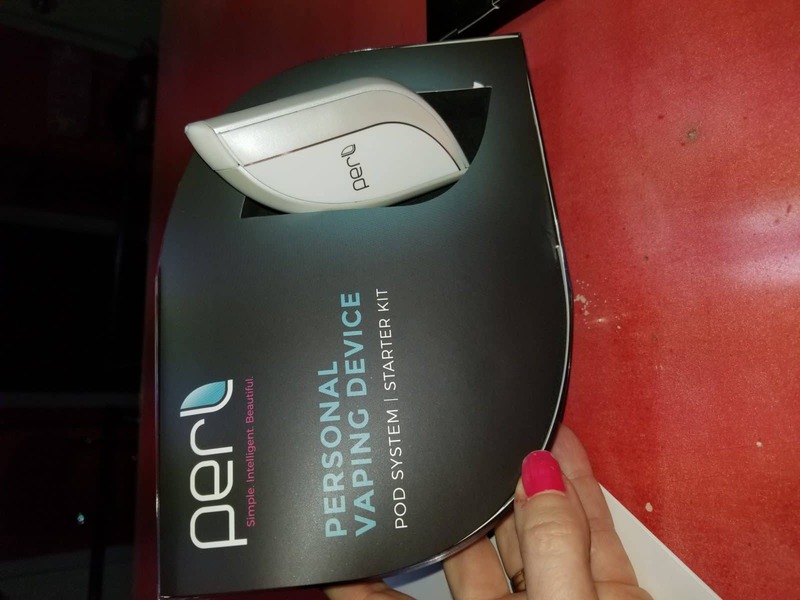 If you are someone looking to give up the stinky sticks and switch to vaping, the Perl is one of the closest feel to smoking devices that I’ve found.